DVA have changed their approach to handling claims of physical and sexual abuse while serving in the ADF. 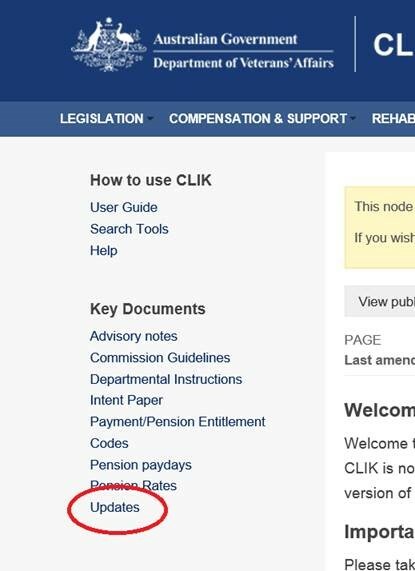 Support and services are now simpler to access for those affected. Please see here for more information on these changes. VVCS provides Operation Life workshops across Australia at metropolitan and regional locations, depending on demand. The workshops focus on suicide prevention. They help members of the veteran community to see when someone might be having thoughts of suicide and to link them in with appropriate help. These workshops are not treatment programs. Workshops are free and open to anyone who is concerned about family, friends, mates or others in the veteran community. Priority is given to veterans and their families. Eligible veterans may receive assistance for travel costs. Welfare officers, pension officers and other helpers from ex-service organisations and the veteran community are encouraged to attend. If an Operation Life workshop is not available in your area then VVCS may be able to help you participate in a similar community suicide prevention workshop. The Australian Veterans’ Children Assistance Trust is a national independent charity helping the children and grandchildren of ex-service men and women to a better future through tertiary education. Through the generous support of the Australian Government Department of Veterans’ Affairs, ex-service organisations, corporate sponsors and private donors, they provide scholarships which assist recipients to obtain the tertiary qualification they need for their chosen career. Applications for Tertiary Scholarships for 2018 open August 18 and close on October 31 2017. To apply for a 2018 scholarship managed by AVCAT contact their office for an application pack. 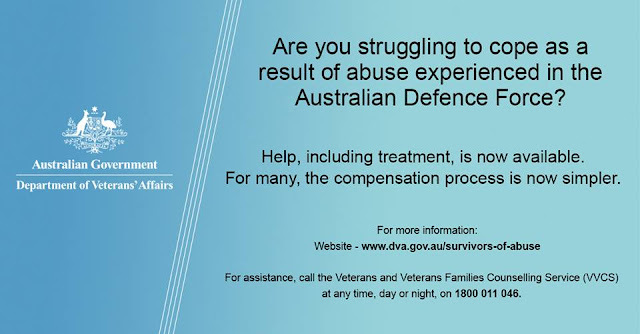 You can email them at avcat@dva.gov.au or phone on 02 9213 7999. Sleep is important to our physical, mental and emotional wellbeing. Problems with sleep are common in the Australian adult population, with many people reporting difficulty either getting to sleep or staying asleep. VVCS invites you to participate in a FREE community webinar about sleep disturbance. It has recently been discovered that when asking for medical documents from Defence Archives, they do not provide anything that is on the electronic records system jeHDI. In July 2014 Defence commenced transitioning to the Defence eHealth Data and Information System, and Defence Archives does not maintain or provide access to records stored in this system. Firstly, members should contact the health centre of their last unit, which is usually where they had their last medical. The Ex-Service organisations (ESOs) and the Government of the Northern Territory have combined in their effort and contributed to a fund to recruit a full time Compensation Advocate. A Military Advocacy Services Committee has been raised, comprising representatives from the ESOs and the NT Government. This is a new initiative and managerial structure designed to improve support to veterans in the NT. 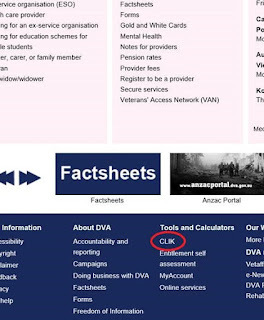 The Consolidated Library of Information and Knowledge (CLIK) contains legislative, policy and reference material used in providing service to the clients of the Department of Veterans' Affairs. 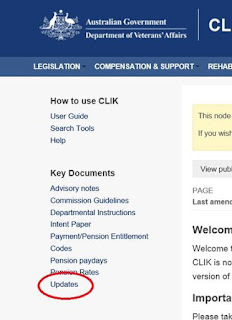 It can be accessed from a link on the left hand side of the CLIK homepage. CLIK can be accessed from a link found at the bottom of the DVA home page, or from the Important Links section on the right hand side of The Orderly Room.